ST. GEORGE — An earthquake struck southwest of Fillmore Saturday night, the first in a series of three quakes to hit the region. The quake was reported 26 miles southwest of Fillmore, measuring magnitude 4.1 by the University of Utah’s Seismograph Station. It was followed 10 minutes later by a second quake measuring magnitude 2.9 and a third measuring 1.7 a half hour later. The earthquake struck in a relatively uninhabited area. As of Sunday morning, the Seismograph Station had received three reports from people who say they felt the quake, which was strong enough to have created light shaking at its epicenter. 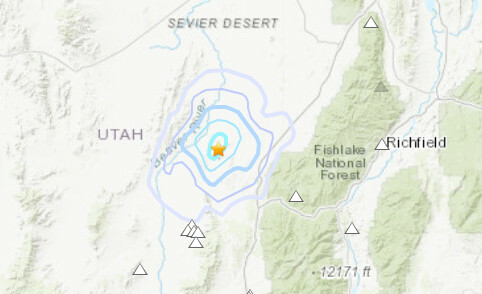 This area is no stranger to earthquakes; in fact, the strongest earthquake to hit Utah in three years struck in roughly the same area Feb. 20 when a magnitude 4.4 was reported 18 miles southwest of Fillmore shortly after midnight, according to the Seismograph Station. The strength of an earthquake is calculated in magnitude and strength, so a 5.0 earthquake is 10 times bigger than a 4.0 earthquake and much stronger in terms of impact, seismologist Paul Roberson said previously. More than 15 earthquakes greater than magnitude 5.5 have occurred in Utah since the Mormon pioneers settled the area in 1847. Geologic studies of faults within the state indicate a long history of large earthquakes with a magnitude of 6.5 and greater prior to the pioneers’ settlement, according “Putting Down Roots in Earthquake Country,” a book released by the Utah Seismic Safety Commission in 2008. While Utah is not a boundary between major tectonic plates where major earthquakes occur, seismic events in the state are indirectly caused by interactions with the Pacific plate along the west coast. Other smaller earthquakes in the east-central part of the state are induced by underground coal mining. Large, damaging earthquakes in Utah are most likely to occur in a belt that extends north-south through the center of the state, essentially following Interstate 15 where there are many active faults capable of producing stronger earthquakes. There is more than a 50 percent chance that a magnitude 6.0 or greater earthquake will occur in the Wasatch Front region in the next 50 years, according to a report released by the University of Utah’s Seismograph Station in November 2017.